When you think of the winter and all of the cold weather much of the United States experiences, flowers may not be the first items to come to mind. In fact, it may feel as though a winter wedding wouldn’t allow you and your partner to have too many blooms from which to choose. However, that is not the case! There are plenty of blooms that are either only in season during the winter or continue to bloom all year long (hello, roses!) that are perfect to include in bouquets, boutonnieres, ceremony arrangements, reception centerpieces, and more. Today, we’re sharing winter wedding flowers that are in season and gorgeous from December through March. When we think of holiday flowers, amaryllis always comes to mind. However, there are more colors available than their typical shades of red and white. We love the bright color shade seen throughout this bouquet, and how it plays off the greenery and dusty blue ribbon. Though they are most often used as filler and not a focal piece, hypericum berries are a winter wedding staple. They work well as a boutonniere, providing a playful pop of color against a dark suit. They can easily be incorporated most designs, providing texture to bouquets, centerpieces and more. To us, sweet peas are some of the most romantic flowers. They typically feature delicate petals and stems, so a bit of care is required. Camellias are one of winter’s gems. Their petals are layered, which adds plenty of texture to their appearance just like this bouquet by Everly Alaine Florals. Plus, they are in season throughout late fall and well into December. Their peak blooming season allows them to be readily available, particularly for early winter weddings. Carnations are some of the most underappreciated flowers. They are hard, which means they will continue to bloom and thrive during winter’s cold months, and they are also available in a variety of colors. Here, wedding designer Michelle Edgemont used carnations to create an eye-catching floral chandelier at a New York City celebration. Anemones are another readily available wintertime bloom, and the white coloring and dark black centers make them perfect for modern and industrial weddings. Here, anemones are paired with deep-hued calla lilies to make for a sophisticated bouquet. Ranunculus are in season during the winter, which is great news for couples who are fans of other soft florals, like peonies, because they offer a similar look. Here, the groom is sporting a simple ranunculus boutonniere by Fleur Chicago, which proves a boutonniere does not have to include lots of elements in order to make an impact. There is never a season in which roses are not available, which means these elegant florals add flair to winter wedding centerpieces. Rather than opting for wedding white, we love how this centerpiece from Boston Magazine chose instead to focus on brighter shades of pink and red. 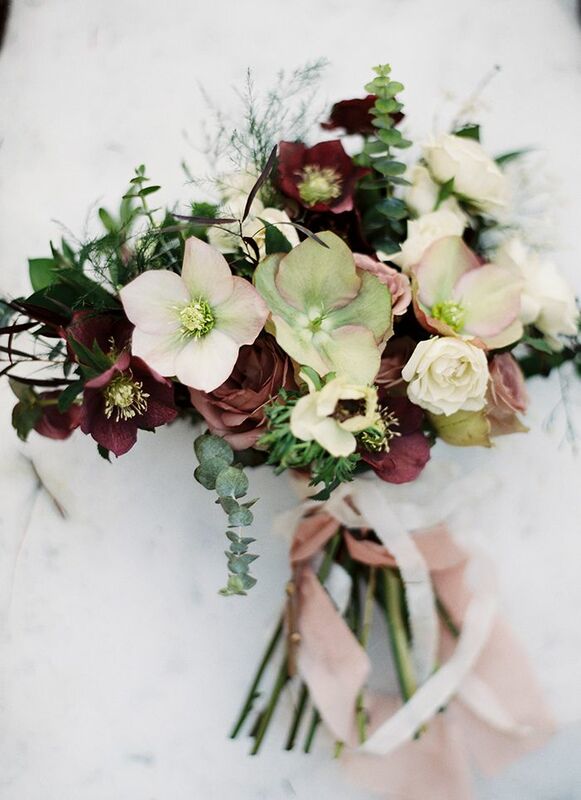 Similar to sweet peas and Camellias, hellebores offer another option for couples planning weddings with romantic and organic styles. They are most often available in shades of ivory, red, purple, and pink, so these soft pink hellebores, designed by Hart Floral Design, are a great representation of this winter bloom. Poinsettias are the quintessential Christmastime flower, and they look particularly beautiful in this modern ceremony arch. Paired with simply greenery, the poinsettias are transformed into something more than a simple potted plant. Gardenias are fragrant winter flowers that are as fitting for bouquets as there are for boutonnieres. We love how this gardenia boutonniere by Lake Murray Flower Shoppe looks against the groom’s classic suit. It’s the perfect look for a more formal wedding or one with a more classic feel. Tulips are often associated with the spring; however, their season actually begins in the winter. They have the ability to transform for varied wedding styles, and here they feel much more modern in these elegant and loose centerpieces. Gerbera daisies can be difficult to style because most couples don’t want their florals to appear too playful; however, this bouquet shines an elegant light on the blooms. The pinecones add a playful—and seasonally appropriate—touch. Calla lilies are similar to orchids because they offer weddings a touch of timeless elegance. They look wonderful in boutonnieres – a single bloom is enough – and the touch greenery in this design from United with Love adds to the wintertime look without taking away any of the flower’s classic charm. Orchids offer another option for more formal, classic weddings. Here, they offer a particularly elegant touch thanks to the candles featured with them down the length of the wedding’s table as seen on Mod Wedding.